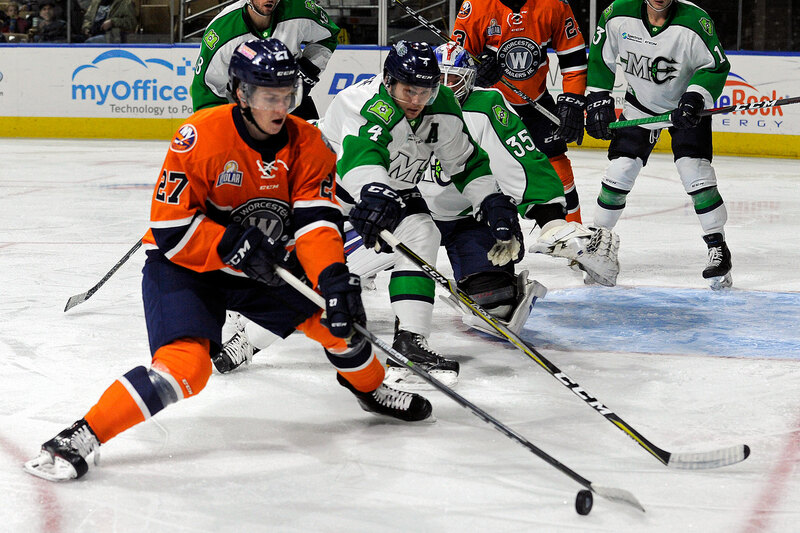 Portland, ME – The Worcester Railers HC (21-20-5-3, 50pts) began their season long seven-game road trip with a disappointing 5-4 overtime loss to the host Maine Mariners (24-24-0-1, 49pts) in front of 1,352 fans at the Cross Insurance Arena on Wednesday evening. The Railers road trip continues with an 8pm (ET) start in Allen, Texas vs. the Americans on Friday. The Railers squandered a three goal third period lead before dropping the game in overtime. Barry Almeida (1-1-2), Ryan Hitchcock, Tyler Barnes (1-1-2), and Dylan Willick all scored for Worcester while Mitch Gillam made 28 saves in net with Tyler Barnes extending his Worcester pro hockey record with a goal in eight straight games as he netted his 21stof the season and extended his point streak to a franchise record ten games (10-4-14). Maine scored three goals in the final 13 minutes of the third period to force overtime before Brycen Martin (6th) won the game in the extra session at 2:57 while netminder Connor LaCouvee made 43 saves in net for the win. Maine went ahead 1-0 as Jason Salvaggio (10th) sent a shot from the left circle that snuck through goaltender Mitch Gillam at 7:25 of the first period. Just 42 seconds later, Maine netminder Connor LaCouvee lost the puck behind the net and Barry Almeida (13th) was able to win the puck and sweep it around the far post for an easy score. Shots were 18-15 in favor of Worcester through 20 minutes of play with the score knotted at 1-1. The Railers played very well in the second period and scored twice to go ahead 3-1. Ryan Hitchcock (9th) gave Worcester their first lead of the night after Tyler Barnes won the puck behind the net and zipped it in front and found Hitchcock for a wicked shot from 25 feet at 1:15. After Alex Vanier dropped the mitts with Terrence Wallin at 14:31, Dylan Willick (6th) deflected a Mike Cornell point shot into the net at 15:00 to put Worcester ahead 3-1. The Railers held a 32-22 shot advantage through 40 minutes of play. Worcester would extend their lead early in the third period with a terrific shot from in tight by Tyler Barnes (21st) on the power play at 1:03. But Maine did not give up as they scored three consecutive goals to force overtime at 7:33 by Josh Couturier (2nd), at 12:17 by Wade Murphy (8th), and the equalizer at 18:00 by Derek Pratt (2nd). Shots were 12-10 in favor of Worcester in the third period as Connor LaCouvee made several big saves to keep the Railers stuck at four goals. In overtime, Brycen Martin (6th) sent a touch angle shot from the left circle on the rush over the shoulder of Mitch Gillam at 2:57 to complete the comeback 5-4 overtime home win for the Mariners. Final shots were 47-33 in favor of Worcester. What’s on tap – ROAD TRIP! The Railers season long seven game road trip continues Friday, Feb 15 with an 8pm (ET) faceoff in Allen, TX vs. the Americans. Coverage begins at 7:35pm (ET) on 98.9 NASH Icon.